My experience drinking this drink was much like eating a high-quality dark chocolate with a high percentage of cacao — the first bite is a bit on the bitter side and, yet, somehow I want another bite and then a few more until I hit a point of rich satisfaction. It was the same with the drink — more satisfying as I made my way through the cup and then pleasantly satisfied after. The caffeine content in the drink was noticeable to me so one cup was a good place to stop. I use a French press coffee carafe to make mine but you could make up this drink like a loose tea (pouring water over the cacao grounds, allowing it to steep, and straining them off before drinking). I have heard that the flavor is not very good when using a regular coffee maker, but your mileage may vary. Scale the ingredients according to your needs. Bring your water to boil while you grind your cacao. 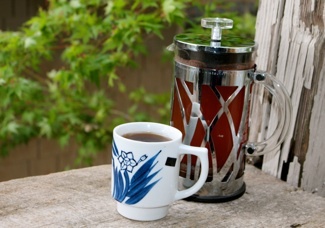 Put the ground cacao into the French press and pour boiling water over. Gently stir the cacao into the water. 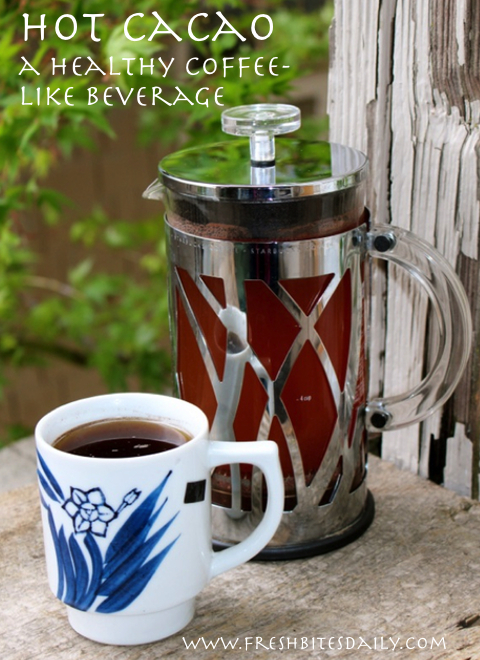 Allow your drink to brew for about ten minutes before serving. Add sweetener and milk or cream, as desired, for an extravagant coffee replacement. 1 Comment on "Hot Cacao Drink (As Good As, Better Than? Coffee)"